Although the sun has been peeking out, its been quite chilly today. 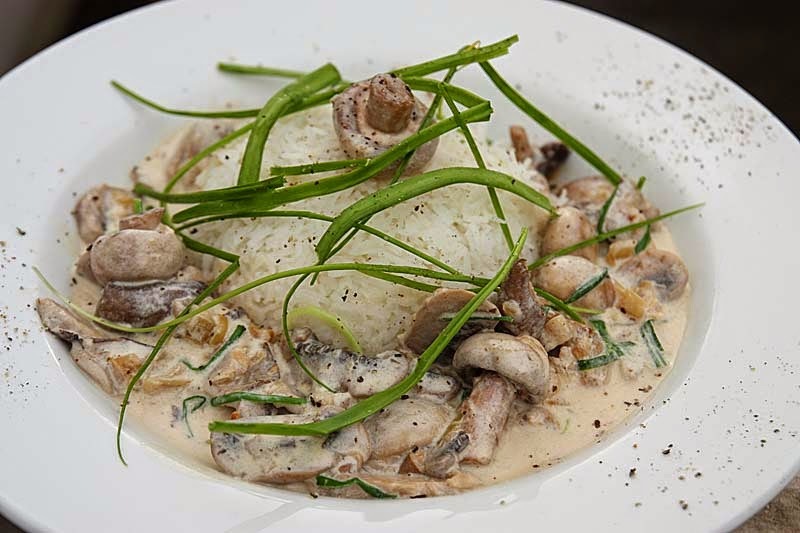 I made one of my quick suppers - Mushroom Strogonoff - its featured on my blog before, but in place of double cream I used soured cream. I also had some garlic chives that I picked up last weekend from a farmers market that I frequent every fortnight now. So I decided to mince some of these down to put into the strogonoff and I kept some stems back for garnish. The garlic chives were new to me. They were certainly garlicky in taste. I found the some of the stems a tad tough sticking a little to my throat as I swallowed, so I would recommend mincing them. 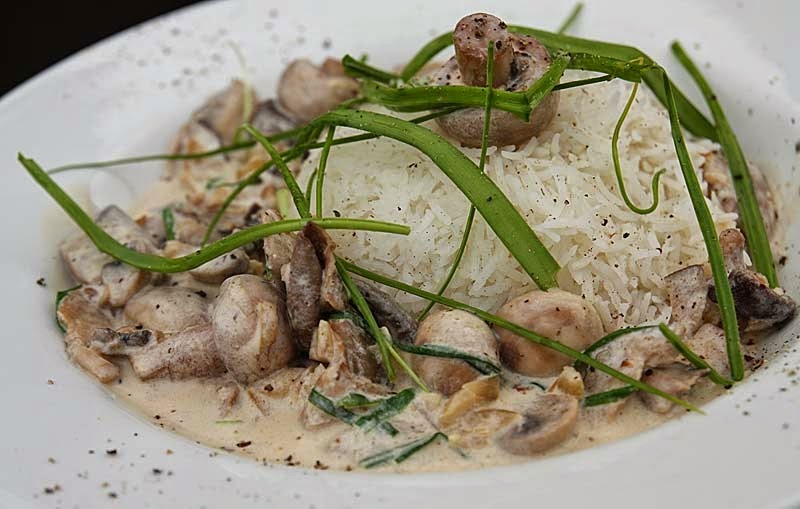 You can serve the mushroom strogonoff over bulgar wheat or pasta if you wish, but my preference is steamed or boiled Basmati rice. In a pan, heat one tablespoon of oil. Add onion and garlic and fry over medium heat until soft and golden. Add mushrooms and continue to saute for about 5 minutes until cooked through. Add vegetable stock , the garlic chives and Tamari or soy sauce to the mushrooms, allow it to gently boil. Then turn the heat down. Add the soured cream and let it simmer for a few minutes until well combined with the vegetable stock. Taste ad and adjust salt and pepper to taste. Serve with plain basmati rice. Garnish with garlic chives. I need to try this with vegan sour cream...it looks so yumful! I love that you left the mushrooms whole and yes, definitely on basmati. Thanks for the recipe! Cheers! I hope you do :) Some of the mushrooms are whole, I have to admit I did cut the large ones in half. I hope you get to try it with soured cream, my preference too. I'm surprised to hear that the garlic chives were tough. They mustn't have been well grown. They should be soft. When we lived in the Far East we often used to have some in stir-fries, for adding colour as well as flavour. Only some of the stems were tough, I think the older stems were not separated from the tender ones when harvested. This is just my kind of meal! YUM! this looks superb... 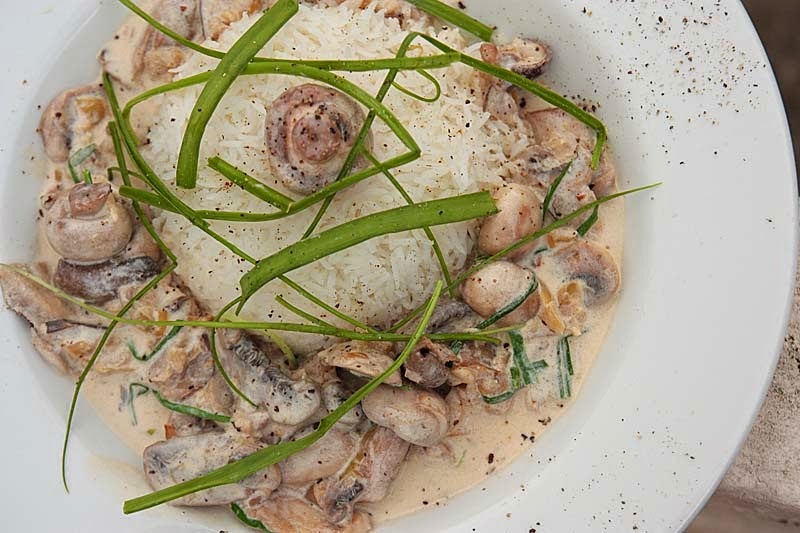 I never think about doing a mushroom stroganoff but I know The Viking loves it, so i've added this to the list... very chic! Thank you so much Rosaria, what a beautiful name you have. Thsi dish should work well with creme fraich and def. large flat mushrooms.